I would not deny that the best reading material while I was in my formative years was "komiks". Komiks or comicbooks are illustrated stories with different topics and genres. In the Philippines, one of the renowned cartoonists is Tony Velasquez and has been since considered as the Father of Philippine Cartoons. Kenkoy is the very first Filipino cartoon character in Liwayway magazine. Let me know who is your favorite Filipino cartoonist or if you've ever read Kenkoy in Komiks. I will be giving away a Solo Kenkoy striped graphic shirt (worth Php595) and a dogtag necklace (worth Php495). Winner be determined through random.org. Thank you to Solo for generously providing these items. Just be a follower and leave a comment. And yes, please don't forget to join Solo in Facebook and Twitter. This is open until September 24, 2011. When Solo launched its first ever Pinoy Cartoonist Memorabilia featuring Larry Alcala’s Slice of Life last year, it was a show stopper. Many people took a trip down memory lane remembering the witty and playful comic characters of Alcala’s Slice of Life. Young and old remember their Sundays looking for the iconic caricature face of Larry Alcala among his cartoon drawings at the Sunday magazine. It is refreshing to see how Alcala’s Pinoy Cartoons are being celebrated and re-introduced to today’s youth as part of Filipino pop culture. This creative collection has got us all hooked! Due to insistent demand, SOLO is brings out another innovation, its 2nd installment of the well-loved Pinoy Cartoonist Memorabilia series. This time it features no less than the greatest work of the Father of Philippine Cartoons, Tony Velasquez’s KENKOY. Antonio "Tony" Velasquez, the Father of Philippine Cartoons, created Kenkoy way back in 1929. Long before the era of the movie stars and showbiz celebrities, there already was a Philippine pop icon named Francisco Harabas, more popularly known as Kenkoy. As Tony Velasquez described him, “He is always pusturyoso”. He was a debonair and his trademark fashion sense was Western influenced: decked in suspenders, charol shoes, double breasted suit, baggy pants, a sailor hat, and a slicked back hairstyle. 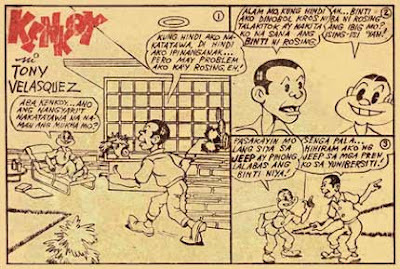 Kenkoy is considered the most influential comic strip in the Philippines and most successful because of the wittiness and humor, as well as his antics, colonial way of thinking, and carabao-english. Kenkoy gained massive following that he was adapted into movies in 1950s-60s and musical act in early 90s. This year, old meets new as Solo Pinoy Cartoonist Memorablia takes timeless Kenkoy comic strips and mixes it up on trendy silhouettes and fabrics with different treatments such as foil printing, embroidery, embossed printing, flocking, high density printing and washed effect. The collection consists of His&Hers graphic tees, polo shirts, woven tops and dresses, men’s long sleeves, shorts and accessories such as stainless necklaces and slingbags, gift sets like watches, vanity sets and lighters and will hit Solo stores in September. Each Memoriabilia Series item will have its own bio-tag of Tony Velasquez as well as its own unique packaging. To view the entire Men's collection, click here and Ladies' collection, click here. Catch more exciting things happening online for the launch of our Pinoy Cartoonist Memorabilia collection. Join us in Facebook and Twitter. SOLO’s best known for doing cool innovative online launches and the first ever online model search in the country. This year, Solo’s doing it again! To celebrate Father of Philippine Cartoon Tony Velasquez’ Kenkoy, Solo brings you the much anticipated and bigger Online Model Search 2011, now on its third year! After we successfully launched Jaggy Tallada and Jhonna Flor as 2010’s grand winners and Mehran Khaledi and Phoebe Rutaquio as 2011's grand winners, we are now on search for two new faces of Solo to be officially unveiled in 2012. Check out Model Search Site for contest details. All participants wearing any apparel from the Pinoy Cartoonist Memorabilia feat Kenkoy are to submit their creative photo entries embedded with graphic elements available for download via the website. Early birds submissions get rewarded with special prizes from Solo! Everyone can register to the contest site to submit entries and/or just vote. And this year, we’re giving away prizes to lucky voters as well! We will randomly pick 3 voters per month (September – November) to win Solo GCs! Modelsearch starts September 1 and ends November 30. Check out more details about the modelsearch on Solo’s website, Facebook and Twitter pages. You may be the next face of Solo!